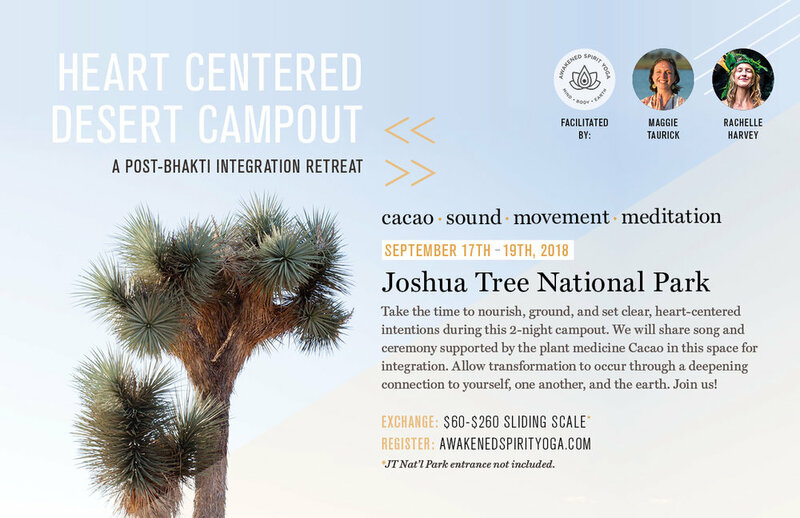 In this 2-night campout we will share song, ceremony, and space for integrating our intentions, pausing from our day-to-day to allow transformation to occur in our ever deepening connection to ourselves, each other, and the Earth. We will work with the plant medicine Cacao as an ally, helping us expand the field of the heart and live in our highest alignment, using sacred sound practices to clear our minds, experience expanded states of consciousness, and find freedom of expression through our voices. By engaging in dynamic movement of our bodies and voices, we'll create space within us, becoming channels for creative source energy and allowing it to flow through us freely. • Sacred snacks will be provided but feel free to bring your own to supplement! Vegetarian brunch, dinner, snacks and cacao will be included. Please bring your own drinking water, and extra snacks if you feel you'll need extra food. Let us know if you have any dietary restrictions. Please pack your own tent & sleeping necessities for staying 2 nights in the park as well as reusable dishware (a plate or bowl, utensils and mug). Entrance to the National Park is $30 per vehicle for 7-days. Please reach out if you are needing a ride or have a few seats to offer so we can organize carpools. Thank you! We’ll be in touch soon regarding the Heart-Centered Desert Campout in Joshua Tree.